(Photo: REUTERS / Neil Hall)The Archbishop of Canterbury Justin Welby poses with female priests after their march celebrating the 20th anniversary of women becoming ordained priests in the Church of England in London May 3, 2014. The Archbishop of Canterbury Justin Welby has praised the elevation of women to the priesthood in the Church of England 20 years ago. "How did we not see that women and men are equally icons, witnesses, vessels of Christ for the world?" Welby asked Sunday. "Twenty years, out of about 450. That's less than 5 percent in the story of the Church of England, so far, a story in which we remain committed to reimagining ministry," he said. Welby who is the spiritual head of the Church of England and the most senior bishop in the 85-million strong Anglican communion, delivered a sermon at St Paul's Cathedral in London at a service to mark the 20th anniversary of women priests. He preached and acted as deacon at the Sunday service. Canon Philippa Boardman presided at the service. "Churches - the best churches, churches as they should be, God's people in action - are not built through victories and defeats in legislative assemblies, nor as a result only of process and deliberation. "Such things are necessary, even indispensable, but they are not sufficient. A good church is forged through its transformation into the likeness of Christ. It is one step of that journey that we mark today in celebrating 20 years of the ordination of women to the priesthood." Welby, who became archbishop of Canterbury, just over one year ago, preached to representatives of all 42 dioceses of the Church of England. Every woman who was ordained in 1994 was invited to take part, sharing Bible readings and their reflections on their ordination. There was also an address from the former Bishop of Bristol, Barry Rogerson, who was the first bishop to ordain women. Canon Philippa Boardman, treasurer of St Paul's, who was ordained in 1994 and who presided at the service, said, "Twenty years ago when the huge wooden doors of St Paul's Cathedral swung open as the procession of the soon-to-be-ordained women came in, it was a time of great hope and also some concern about the impact on the unity of the Church. "In the great history of the Church, twenty years is no time at all, and I am conscious that this is just the beginning of so many good things to come." Professor Linda Woodhead, of Lancaster University, told the BBC on Saturday that women generally held "lower-status, lower-paid, lower-power" roles in the Church of England. Latest church statistics show that female clergy account for 24 per cent of full-time stipendiary clergy and 53 per cent of self-supporting ministers. 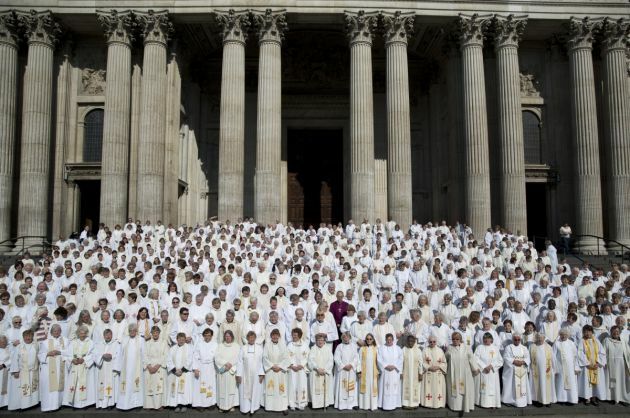 Just 11 per cent of senior clergy are women. There are also fewer younger women being recommended for ordination than young men: in 2012, 71per cent of those under 40 were male. The Church of England has also not yet approved the ordination of female bishops, an issue that has overall support from bishops, but does not have the required support of laity in the governing structure.